I heard of 4k but what's 0k? Anything below 1000 pixels wide, I guess? I have a second question: Would it be possible to "salvage" 3D engine in JJ2 (the one used for orange games logo and which was supposed to be used for bonus levels like in JJ, but was cut) or is it too broken for it to be a possibility? If it could, I think JCS could be used to make "bonus stages" How? A special "top down" tileset and different extension (j2lb? j2bl?). Level data could be just interpreted differently in the bonus stages. ╲___) (___╱  TUX LOVES YOU. This message has been deleted by Darkhog. You say JJ2+ is included with the GOG version, but I'm just getting the normal game, without JJ2+, and I cannot manually install JJ2+, says it cannot patch it. What's going on, am I missing something? Last edited by StrikerTheHedgefox; Dec 8, 2017 at 03:18 AM. You say JJ2+ is included with the GOG version, but I'm just getting the normal game, without JJ2+, and I cannot manually install JJ2+, says it cannot patch it. What's going on? The ordinary GOG installation is the LK Avalon version, which is not compatible. You need to go to the download page on GOG and download the JJ2+ installer from "Game Goodies" on the right. Or if you're using GOG Galaxy, go to The Secret Files' Settings page, enable Beta Channels, and choose the JJ2+ channel. By the way, what's special about the LK Avalon version? What Violet said. It's not that different from the other version of JJ2 (or TSF), but it's internally different enough that making JJ2+ compatible with it is difficult. AFAIK it also have few bugfixes for few of the crashes that happen in P2 version and I think, though not sure, stuck in the wall bug. Probably fixes like that make it incompatible with JJ2+. Anyway, if I'd copy over anims.j2a from LKA version to JJ2+ (not the exe, just anims.j2a), would JJ2+ read it correctly? If so, I may have an idea how to enable Polish for JJ2+. No, it doesn't. Really, all it does is add LK Avalon's logo to the intro movies and support for Polish.j2s, and shift around anims to add Polish letters (ą, ć, ę, ł, ń, ó, ś, ż, ź). Well, nothink stops me from trying, right? I've replaced Italian language with copy of Polish.j2s and the main "bug" that I've noticed was the lack of Polish letters (e.g. "Wyjdź", which means "Quit" becomes "Wyjd" and so on), a thing LKA's anims.j2a solves by including these characters in the font. Maybe I'll come across some other issues, maybe not, I'll solve it one after another. Probably the "core" of the fix would be replacement of anims.j2a with the LKA one (a thing I won't provide for the legal reasons) and then replacing one of the languages with Polish.j2s (which I won't provide as well for the legal reasons). This would be directed towards Polish people anyway, so I don't think so they'd be bothered that they need to select, e.g. "italiano" for Polish language. Again, there may be more issues, there may be less, I'll cross these bridges as I get there. You're in luck, the next Plus release will support an arbitrary (well, probably not arbitrary) number of language files, including the Polish one, if everything works out. Nice. So I'll just need to see about that anims.j2a replacement, unless you will implement Polish letters as well in Plus. Then it's just about putting Polish.j2s from LK Avalon version and making GOG do it by default. Please tell me, if you'll be adding Polish letters as well so I won't double the work and waste my time with anims.j2a replacement. Are you sure? I remember doing several things as a kid that according to the wiki would crash P2 version of JJ2 and I had LKA one. For example I remember pepper spray being my favorite weapon which I've used like crazy. There's a crash bug associated with it and LKA version never crashed because of excessive use of pepper spray. Guys when I'm trying to install jj2 plus latest patch version installer is malfunctioning there's some error which automatically stop the installation bar.How to fix this problem? Reading the error is a good place to start. What does it say? I have no idea why I have jj2 1.24 version what does it mean? how to fix it? Btw I non plus jj2 at least I can play more custom maps thanks to this. Do you have the LK Avalon version of the game? VioletCLM I have the same version of jazz jackrabbit 2 like you. Do you have the LK Avalon version or not? Then you can't install JJ2+. You can buy a version of JJ2 that is compatible with JJ2+ at GOG. Do gog.com digital version of Jazz Jackrabbit 2 Collection includes The Secret Files+Christmas Chronicles including jj2+? Same for Jazz Jackrabbit 1 Collection are there Epic Pinball+Holiday Hare '94 and Holiday Hare '95. Stijn do you have gog.com account? I have so can you share with me I mean can you buy me this game as gift, please? 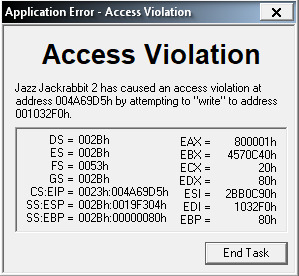 Btw I was trying to find current version of jazz jackrabbit 2 plus, but I didn't find it even on moddb. It's on moddb, linked to multiple times from the first post of this thread. 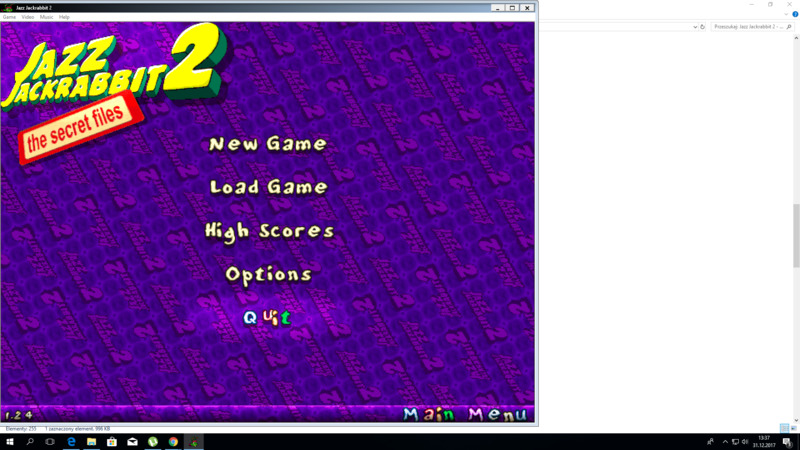 If you have the installer, as in your screenshot above, you have the current version of jazz jackrabbit 2 plus. 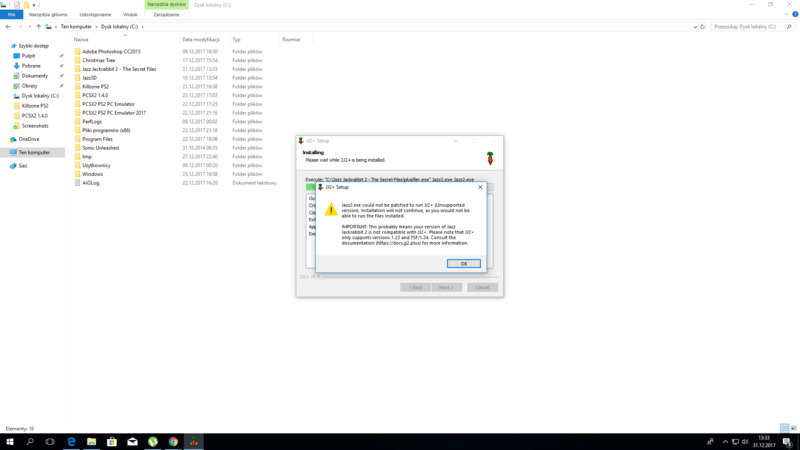 Well I already installed jazz jackrabbit 2 plus and I already played Holiday Hare '17 really amazing I was enjoyed of this chapter,but some error message popped up and ruined everything and jazz jackrabbit 2.exe stopped responding you should fix it. In what level did it crash? At what point in time did you download HH17? Just try redownloading the episode anyway. I don't remember the time of when I was playinformed Holiday Hare,but I will check first what's the version and then I will at least tell you time and date when I downloaded Holiday Hare '17. This thread—and by extension, JJ2+ version 4.0—has been around for five years now. The full list of changes can be found over here. Last edited by Violet CLM; Apr 20, 2018 at 08:40 AM. If JJ2+'s improved support for .j2s files has you interested in making your own translation, here's an updated version of DJazz's j2s tool that lets you translate the strings from TSF levels too. When you're done making your translation, upload it to J2O, and if it looks good we'll include it in later releases of JJ2+.